Commemorating the 100th Anniversary of the Darr Mine Disaster in Pennsylvania. On December 19, 1907 an explosion in the Darr Mine took the lives of 239 men and teenage boys as young as 14. Most of those killed were Hungarian immigrant laborers. AHF, five member organizations, and others have joined forces to help ensure they are not forgotten. September 29, 2007; 11:00 a.m. Numerous organizations have joined forces to help us remember this important occasion. such as The Bethlen Home, The William Penn Association, the Hungarian Reformed Federation of America, The Calvin Synod and Hungarian Reformed Church, and the Rostraver Township Historical Society. Sponsoring organizations issued a joint statement, saying, ""By remembering the Darr tragedy, we reaffirm our nation's focus on safety in the workplace..." "We affirm that the sacrifices were not in vain, and we pledge ourselves to continue working together for the good of humankind." 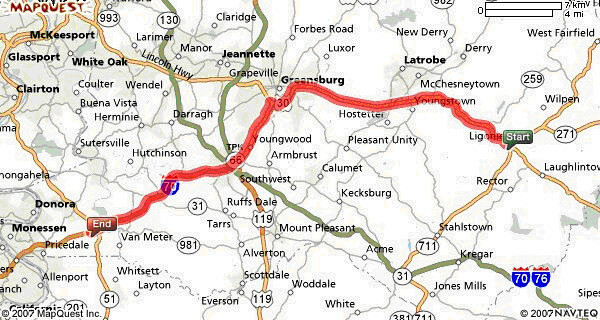 The Darr Mine Disaster is known as the second worst in US history and the worst in Pennsylvania history. On December 19, 1907 a gas and dust explosion killed 239 coal miners in the dark tunnels of the Darr Mine near Rostraver Township in Western Pennsylvania. The majority of the dead were Hungarian immigrant laborers. December 1907 would go on to be The Deadliest Month in US Mining History. The month began with an explosion that killed all 34 miners inside the Naomi Mine in Fayette County on Dec. 1. Five days later, the single greatest mine disaster in American history occurred when massive explosions and roof collapses killed 362 men in Monongah, West Va. Ten days later, on Dec.16, an explosion in the Yolanda, Ala. killed 57 miners, many by asphyxiation. By the time this deadly month ended, more than 3,200 American miners had died in accidents. In Pennsylvania, 1,400 miners died that year, 708 in the Anthracite mines, and 806 in the Bituminous fields. The total dead at Darr could have been much higher, eclipsing even the Monangah disaster, if not for the fact that many of the miners were recent immigrants of the Orthodox faith which celebrates the Feast of St. Nicholas on December 19 according to the Julian calendar. As a result, nearly 200 miners chose not to go to work the day the explosion happened. Those that chose to work that day were mostly Hungarian immigrants. 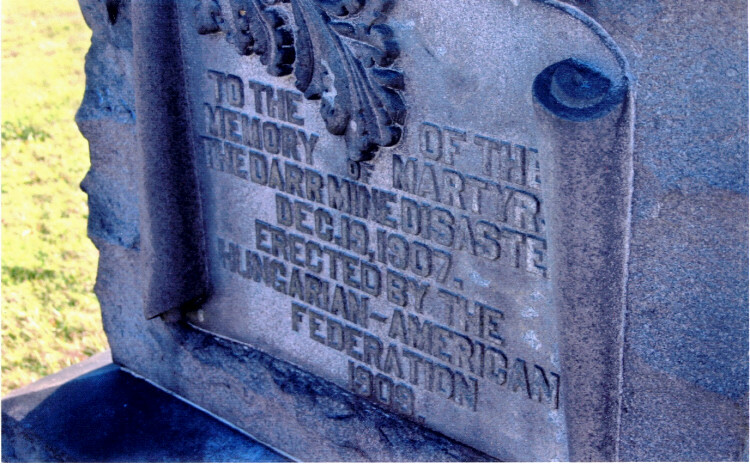 The American Hungarian Federation (then known as the Hungarian American Federation) placed the memorial seen here in 1909. An inquiry into the disaster afterwards concluded, as was usually the case in that period of Pennsylvania coal mining, that the Pittsburgh Coal Company was not at fault. Pete Starry, a mining historian, provided an interesting article to the The Coal Miner's Memorial. It was The United Mine Workers Journal from Dec. 1, 1957, entitled, "Main Thing was Management Neglect:"
"All of the mining disasters of December, 1907 had several things in common. The main thing was management neglect and insome cases brutal criminal negligence. Black powder was used for blasting in all of these stricken mines. Coal dust was allowed to accumulate in spite of warnings from England that it was highly explosive. All of the mines were gassy and seem to have been poorly ventilated. It is quite possible that the Jacobs Creek disaster would not have taken place if the men had been allowed by Providence one more day to dig out 40 feet of coal to reach a new shaft the company had sunk in an effort to improve ventilation in the mine. One of the victims of the explosion was a mine foreman, H.S. Campbell. His widow reported that his main preoccupation and worry in the months preceeding the blast was with the gassy condition and poor ventilation in the Darr Mine. He pestered the company about it and it was at his urging that the new ventilating shaft had been sunk. Campbell's worry, which made him tell his wife he could not even think about Christmas, goaded the company into action, but it was 24 hours too late for 239 men." The PA EPA wrote: "The Darr and Monongha disasters marked the first use of self-contained breathing apparatus in a deep-mine rescue in the United States. Other major advances in mine safety followed soon after. Within six months the U.S. Geological Survey created the Mine Accidents Division and opened a station devoted to research of mine rescue techniques in Pittsburgh. In two years, branch stations were established in Illinois, Tennessee and Washington. And on July 1, 1910 an Act of Congress established the U.S. Bureau of Mines. In September 1994, the Pennsylvania Historical & Museum Commission placed a Historic Site Marker honoring the coal miners killed in the Darr Mine Explosion, Dec. 19, 1907. The plaque is located at the Olive Branch Cemetery, on PA Route 981 between PA Route 51 and Smithton, PA. The marker was not erected until September 1994. 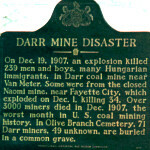 "On December 19, 1907, an explosion killed 239 men and boys, many Hungarian immigrants, in Darr coal mine near Van Meter. Some were from the closed Naomi mine near Fayette City, which exploded on Dec. 1, killing 34. Over 3000 miners died in Dec. 1907, the worst month in U. S. coal mining history. In Olive Branch Cemetery, 71 Darr miners, 49 unknown, are buried in a common grave."